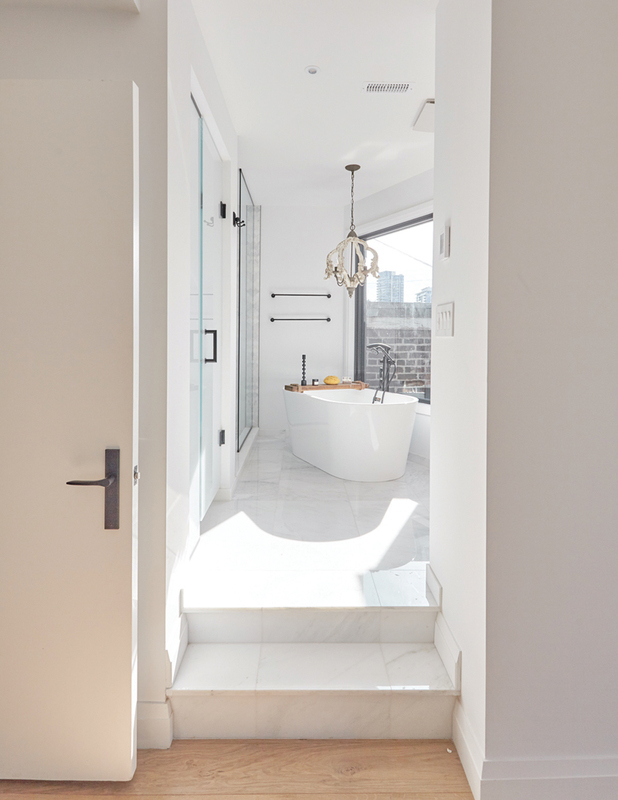 Last year, a daringly sculptural residence took form on a quiet street in Toronto’s leafy Trinity Bellwoods neighbourhood, just west of the downtown core. Although small in size, the completed house, called the Fold, is a compelling and sophisticated piece of urban design. Its distinct materiality and powerful massing assert the house’s own autonomous presence while speaking to its surroundings. The result is a robust, yet jewel-like exercise in the typology of the urban attached house—one which honours Toronto’s history of Victorian eclecticism without sycophantic emulation. A folded copper roof wraps around an outdoor room and distinguishes the house from its neighbours. The house’s most striking move is a diagonally sloping folded roof that negotiates the difference in roof forms between its northern and southern neighbours. This reconciliation of the house to its urban situation did not unduly constrain Ja Studio; rather, it provided the Toronto-based partnership of Behnaz Assadi and Nima Javidi with an opportunity for the complex formal expression which has become the studio’s trademark. As with many of their recent projects, the outcome is an intriguing and successful contribution to their adopted city’s heteroclite architectural catalogue. While the lower half of the main façade remains clad in its original brickwork (the Fold is in fact a forceful yet sensitive repurposing of an existing structure), Ja Studio chose weathered copper panels produced by Canadian firm Copper in Design for the main façade’s upper reaches. This decision—together with the relatively limited use of glazing—gives the Fold a singular presence within its neighbourhood. The metal façade’s dappled texture subtly echoes the patterning of the brick wall below, indicating the care with which this material was chosen. 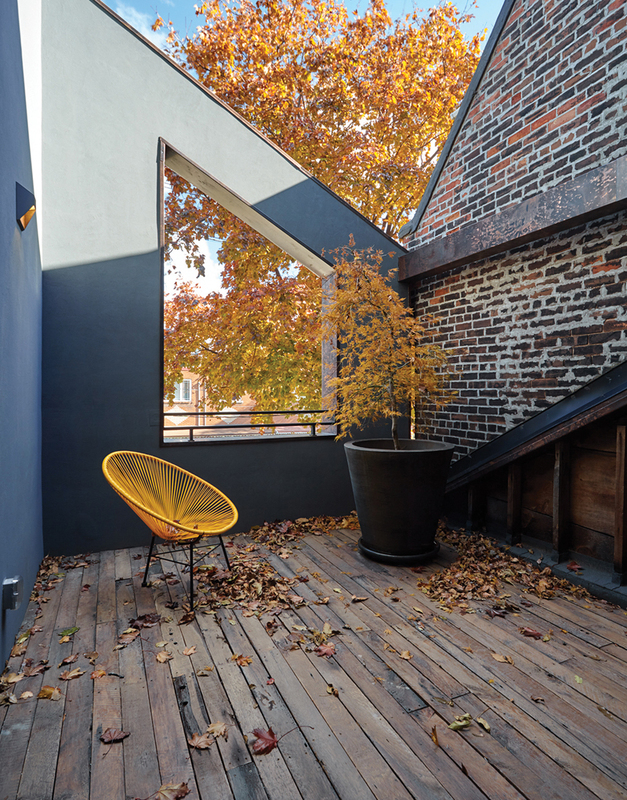 The outdoor space can be used throughout most of the year in Toronto. 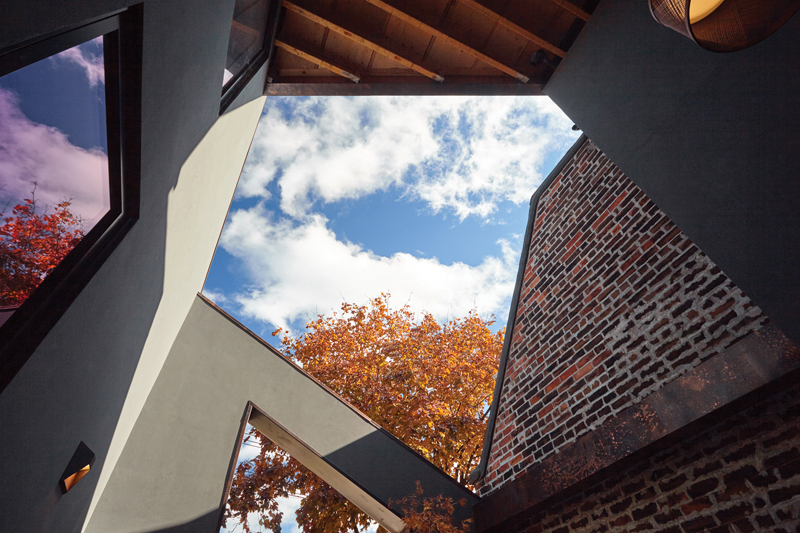 A double-height exterior space inserted within the façade gives the house’s volumetric geometry a dynamic appearance as observed from different points on Strachan Avenue. Protected by the street’s dense foliage and framing a trapazoidal expanse of sky, this outdoor room links the house’s domestic environment to the public theatre of the city. It creates a thoughtful inside-out condition which challenges the climate-driven Canadian equation of the façade with a sealed envelope. This effect is amplified by the architects’ decision to leave exposed the wood framing supporting the copper roof above, thereby revealing the lightweight tectonic logic behind the Fold’s forceful massing. 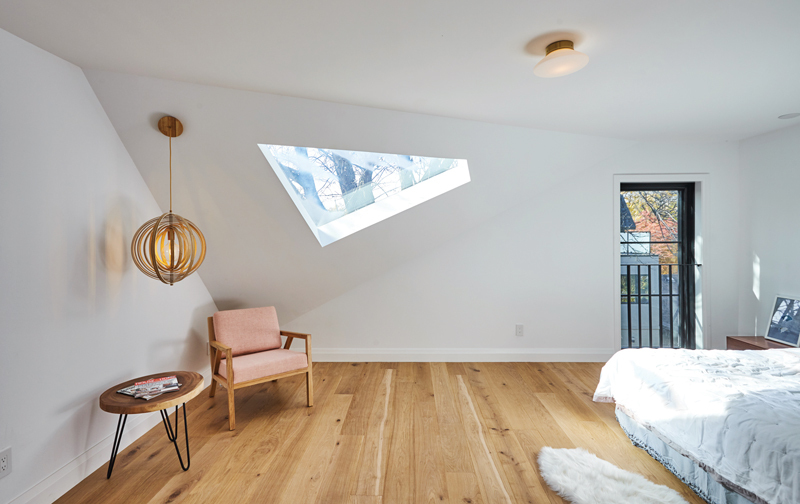 An opening set into the ceiling of a third floor bedroom continues the geometric motifs of the home. Semi-enclosed outdoor spaces are inserted along both the front and rear façades of the house. A similar exercise has been performed on the rear façade, in which a multi-storey opening frames terraces on the second and third storeys. The former is reached from the master bedroom and bathroom; the latter from the children’s bedroom. Again, these room-sized spaces allow the urban realm to animate its domestic counterpart without unduly intruding. Inside, the ground floor is an expansive, high-ceilinged L-shaped space which wraps around the front façade garage. Three ceiling-height glass doors extend the open-plan living and cooking areas out onto the rear terrace, and flood the space with generous western light in the afternoon and evening. A top-lit, sculptural stair connects the four levels of the home. 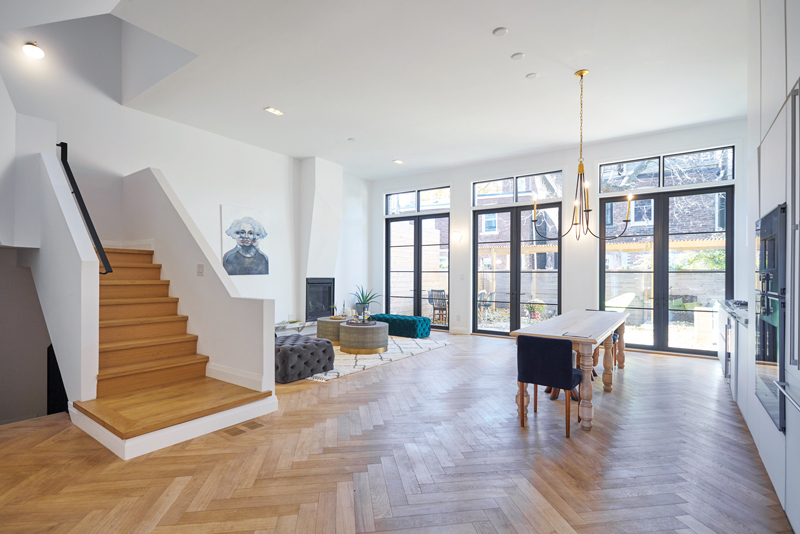 A top-lit pentagonal staircase links the living area to the other floors. The staircase’s articulate geometric expression testifies to the flexibility of North American wood frame construction—an ongoing area of exploration for the architects—offering the designers a powerful spatial tool to bind together the house’s four levels, from the basement to the attic. Beyond permitting light to penetrate deep into the house, the staircase also allows for carefully calibrated changes in section within storeys. For example, the street-facing exterior room (which is accessed directly from the staircase) sits atop the ground-floor garage, both of which are set slightly lower than the adjoining interior spaces on their respective floors. The second-floor bathroom has access to a rear-facing balcony. A slight level change, rather than a door, connects it to the master bedroom. While the house’s peculiarities suggest a specific family, in fact, the Fold was built on spec by developer Luloo Boutique Homes. It’s the third built project undertaken between Ja and Luloo. This partnership has involved a clear demarcation of responsibilities, with the latter handling many of the interior finishes and furniture, leaving the architects to orchestrate the interior spatial configuration and control the houses’ exterior appearance. A view of the outdoor room at the front of the house, which is lightly enclosed by new partitions and bordered by the neighbour’s fire wall. The studio’s own way of working emphasizes considered drawing and well-crafted model-making, as well as an open spirit of collaboration between Assadi, Javidi, and a small, dedicated team of young architects and students working in the office. It’s yielded a rigorous practice which consistently produces provocative designs. Ja Studio’s willingness to work in a studio mode within the economic system of North American urban homebuilding allows the architects to drive their typological experiments forward in a consistently impressive fashion. In the case of the Fold, the result is a significant contribution to the ever-changing artefact that is the city, from one of Canada’s most exciting firms. Architectural historian Peter Sealy is a lecturer at the Daniels Faculty of Architecture, Landscape, and Design.